How to wish your family members in a unique way through Versuasions? Do you want to send family bonding message or quotes to your parents, siblings or any other member? Do you wish to show devotion toward your family? We have messages for all those included. 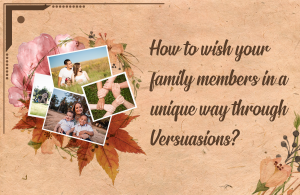 Our Website (www.versuasions.com) contains the best family-oriented messages, which will highlight the relationship between family members. We live in a world where wishes are limited to emotionless Facebook wall posts and Tweets. Have you noticed fulfilling messages and overall emotions for lack of better terms, “has left the building.” Our Job at Versuasions is to provide the right portal to bring emotions to the forefront. Versuasions is a digital platform that will take you back to the time when everyone nurtured their relationships by celebrating special moments. We are the purveyor of human emotions which demonstrates care and warmth through innovative, authentic and quality expressions. There are multiple ways to send your best wishes, such as greeting cards, SMS messages, letters, and even simple quotes. Additionally, there is Versuades-the new online way to greet your family members. It’s akin to a gift which has the power to express all human emotions, be it love, humor or admiration and yes frustration. Versuades USP is its expressive content and will bring in much warmth and joy to both the sender and receiver. Using Versuasions is very easy. It’s convenient, unique and to the believe it or not paperless. Registration is indeed simple. 1. Log in by clicking on this link https://versuasions.com/login/. 2. Select an appropriate Versuade under the family category. 3. Now you can download, send or share to a loved one’s mobile device or social media platform. (Facebook, Whatsapp, Instagram) And if a social media profile is yet to be established, a Versuade can be shared by sending through an SMS. 4. Now your loved one can cherish A Versuadeat any point in time. Everybody expects a happy family. Hope these family Versuades will strengthen your family relationships strengthen bonding and inspire all the other members. Download, send or share a Versuade.